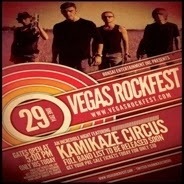 This will be your Only chance to see Kamikaze Circus Vegas Rockfest with these awesome Las Vegas bands together in one amazing festival. All Ages allowed. "The Las Vegas Rock & Roll showcase of the year." Pre-Sale tickets & line passes available now for only $10. Reserve your ticket today. This will be your only chance to get tickets for $10! Full List of Featured Bands and DJs will be released Very soon... once details are released, Vegas Rockfest ticket prices will increase to $50 for General Admission and $60 for the Line Pass.